For every situation in a relationship there are usually three truths. The three truths are always different from each other. There is his truth, her truth, and the truth. The Truth about the situation is simply what happened. It consists of the specifics. That includes everything observed through our five senses: what we see, hear, touch, smell, and taste. Nothing else! The truth does not include what we thought or felt about the situation. It does not include how we interpreted the situation. It includes what might be observable through a camera and microphone, not the motives behind what is seen and heard. The truth consists solely of the data, and the data alone. His Truth and Her Truth are the stories that they tell each other, or make up, about The Truth. Your Truth is the sound of your voice in your head telling you how you interpreted what just happened. It includes what you are feeling and thinking. It also includes your opinions about the motives, thoughts, and feelings of others. It is Your Truth because it is the story that you are telling yourself about that specific situation. 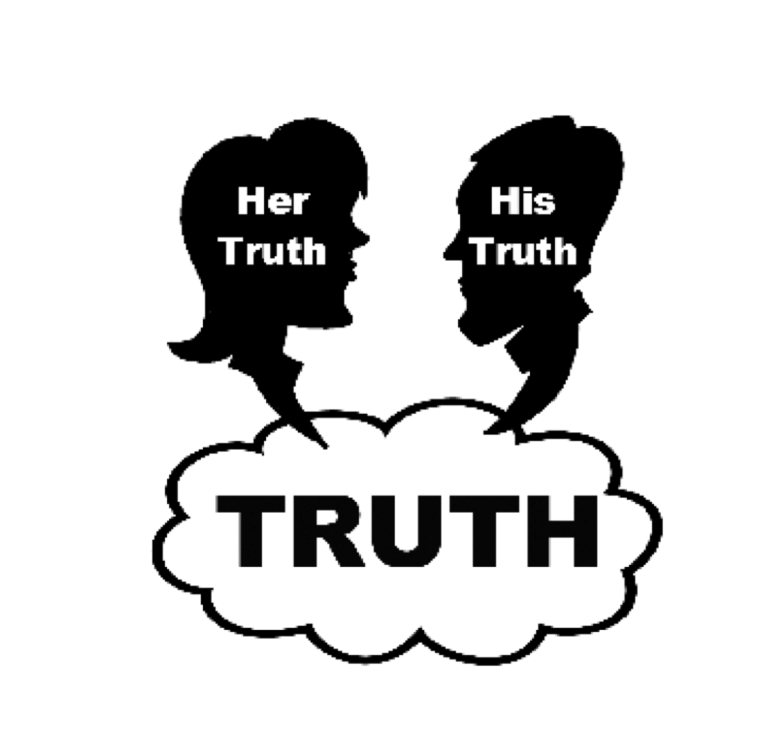 All arguments happen because there is a huge difference between his truth and her truth. In the example of our discussion about where to eat, Roy’s truth is that his wife really loves Chinese food and that he wants to make her feel loved and special. He dislikes Chinese food and only chooses to participate in order to sacrifice his desires in an effort to make her feel special. She does not appreciate his sacrifices for her happiness. Devra’s Truth is that she enjoys Chinese food along with many other types of food. She enjoys spending time with Roy more than she enjoys where they dine together. When he confronts her, she is oblivious as to what she has done and feels frustrated that she is being blamed for how he is feeling. She feels like she is always being judged as doing something wrong. The Truth is that Roy suggested eating Chinese food and Devra agreed. Over the years, Roy and Devra dined at Chinese food restaurants. Roy said, “Why don’t you every do anything nice for me?” and Devra said, “Why do you always think I’ve done something wrong”? Roy taught several semesters of “Intro to Psychology” to college underclassmen early in his career. He enjoyed sharing the research behind how several people can view the same situations and report different details. In fact, there is a great amount of research today backing the idea that crime scene witnesses are not very good at identifying the perpetrator. People have been studying this for years. They’ve concluded that the reason people differ so much in interpretations is due to our brains. All sensory input such as taste, smell, touch, sight, and hearing travels through sensory nerves to the spinal cord and into the brain stem. Between the frontal lobes (the thinking part of our brain) and our brain stem is a group of brain structures known as the limbic system. This is the feeling part of our brain. The data that we see, hear, smell, taste, and touch is felt first. As it travels through the feeling portion, our feeling memories are triggered… that’s why when we smell certain smells we automatically begin to feel great. An example of this is encountering the scent of our favorite dish cooked by our grandmother. The sensory nerve of smell travels to the thinking part of our brain where we interpret what is sent from the feeling part of our brain. The thinking portion processes it with a number of high cognitive functions to judge and define what it is that we just experienced. What feels like just the facts, usually includes feelings and many judgments or opinions about what we just experienced. As data travels from our senses, it is filtered by our feelings. By the time we think about it, the data is no longer just data… it is warped by our emotions. All arguments happen because there is a huge difference between his truth and her truth. Arguments disappear as we close the gap between his truth, her truth, and the truth. In our own relationship and in the many relationships into which we have been invited to help, we have come to the conclusion that Speaking and Hearing the Truth is the core place to make a difference in preventing unhealthy relationships and divorce. It is the core place at which relationships can be restored, hearts can be reunited, and love can be rekindled. Find the book, The Secret to Lifetime Love: Speaking and Hearing Truth, in audio, ebook or printed form at LifeTogetherForever.com. Contact us at www.LifeTogetherForever.com if we can help you or a couple you know.